Another solid opener. Nakanishi and Nagata have been feuding on this tour, usually teaming with young lions and facing one another. This time, Nagata submitted Umino with a crossface. This was pretty good, crowd was into this as time went on. Goto and Oka worked really well together. Oka escaped a Boston crab attempt, but after escaping Goto caught him with a penalty kick then pinned him. Kind of just there as a match, not much to talk about. Takahashi picked up the win again, much to Baretta’s chagrin. He pinned Jado with the pimp juice DDT. I liked this match as it was smartly booked to give Robinson and Finlay a win over two of the biggest guys (in a literal sense) in the promotion. Theme of the match were the two big lads overpowering Finlay and Robinson, but the latter would gain momentum with tandem work. Tonga went for a chokeslam but Finlay cut him off with an axe handle, landed a stunner and shoved him over to Robinson who pinned him with the pulp friction. Tanahashi hair update: it’s still really short, obviously, but he has the highlights back. I guess the movie role is finally over. Suzuki-gun were up to their usual tactics. Taichi got the heat on Tanahashi by using the ring bell hammer, even jamming it up his nose. Iizuka bit on Tanahashi’s bum bicep. Taguchi made the hot tag and looked pretty good, eventually surprising Michinoku with a roll up for the win. This was a fun three way as far as action went, but the crowd were absolutely dead for it which hurt the match. War Machine brawled with KES for a while, with KES getting the heat on Hanson. Rowe made a hot tag and took care of GoD. KES broke up a GoD pinfall attempt following Guerilla Warfare and hit the killer bomb on Tanga Loa. War Machine took out KES, then won with Fallout on Loa. This was good. This was build between Naito and Ishii for their match next month at King of Pro Wrestling. Naito worked over Ishii’s knee, which was all bandaged up. This might play into their match next month, but that’s still a ways away. Ospreay cleared house towards the end, but Takahashi caught him off guard and Naito followed with the Destino. EVIL and Okada worked together here and had some good back and forth encounters. Yano and SANADA did as well since they’ve kinda been feuding during this tour. BUSHI hit the MX on Romero, but faces broke it up. He was going for it again when Yano stopped him on the top rope. SANADA responded by tying him up with the paradise lock on the ropes, keeping him stuck. It boiled down to Okada and EVIL again, with the latter hitting the STO to send him out of the match for good. BUSHI hit the MX on Romero once again and retained. Until the last few minutes, this kind of just felt like a match. Not bad but nothing remarkable about it. Gedo was wrapped in the paradise lock as well after the match, I guess for good measure. As expected, the lumberjacks in the match were made up of Taguchi Japan and Suzuki-gun members. This was bad by any standards, but this was a particularly awful New Japan main event, one of the worst in a long time. Think of every trope Suzuki-gun matches have had all year, then crank it up to 27 and you have this match. Almost every time Elgin had the heat they would interfere and kill off the flow of the match. This would be fine if there were periods of good action, but aside from a few moments there really wasn’t anything here but lifeless brawling. 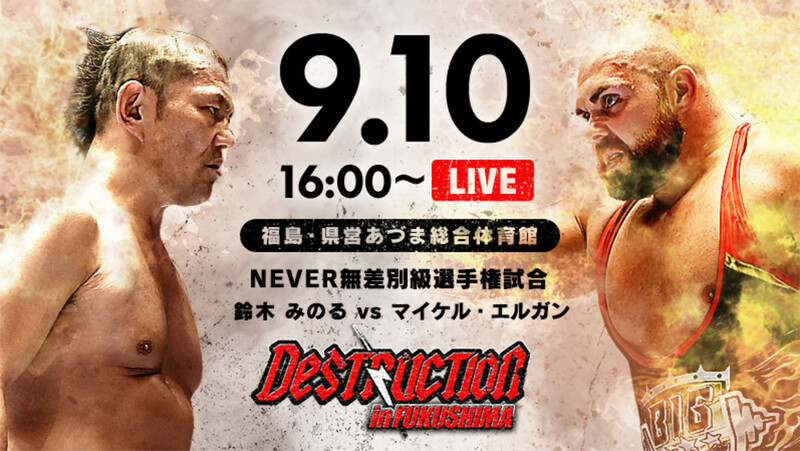 The last few minutes were downright annoying with every other Suzuki-gun member who wasn’t a lumberjack came in to interfere, then we got topped off with a horrible finish involving Iizuka’s comically awful iron fingers of death to end the show on a really bad note. This is one of those matches where you have to question if the Suzuki-gun gimmick is good heel heat or just masking some of Suzuki’s flaws as he gets older. And if it's the latter, they didn't do a great job tonight. Match was what you would expect from the start: Suzuki jumped Elgin after a clean break and brawled with him all around (and outside of) the ring. A chair was introduced, and Suzuki was set to use it. Elgin grabbed it, acted like he was going to use it, then dropped it, calling back to the DQ from a few days ago. Elgin was beating up Suzuki in the corner when all of Suzuki-gun ran in to interfere, with Desperado distracting the referee. Elgin took care of them, but when they came back again Elgin took Taka Michinoku and threw him into the crowd. Ricochet followed with a huge dive that took out the rest of Suzuki-gun and Taguchi Japan. Elgin had the pinfall with the Elgin bomb when the referee was taken out of the ring. Killer Elite Squad ran in, but War Machine came in and took them out. Then Takashi Iizuka came out with the iron fingers. Elgin had Suzuki in a torture rack when Iizuka came in and hit him with the iron fingers. Suzuki then immediately hit Elgin with the Gotch piledriver for the win. Suzuki-gun laid out the rest of Taguchi Japan after the match. Suzuki cut a promo, saying that he came back to NJPW to clear out the roster and ordered the crowd respect the king of the wrestling world.